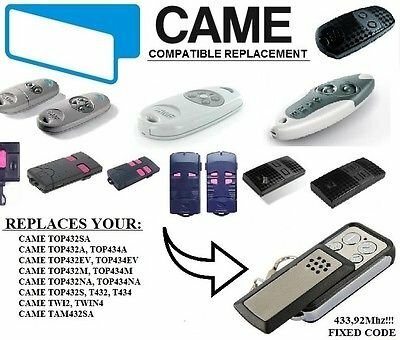 THIS REMOTE CONTROL 100% COMPATIBLE WITH:CAME TOP432NA,TOP434NA, TOP432A,TOP434A,TOP432SA,TWIN2,TWIN4,TAM432SA remote controls. Since universal remote keyfob cancopy most fixed code or learning code remote controls face to face in seconds, you can use one remote to deal with every customer who needs replacement remotes. This 4-Channel Universal RF Remote Control Duplicator suitable for cars, gates, garage door openers, barriers, home security systems, etc. With this remote cloner you can clone all 433.92MHz fixed code key fobs. Some remotes that use this frequency are listed below. This is not a complete list! If your remote uses the 433.92MHZ frequency and is using a fixed code it will work with the remote duplicator (note:rolling code remotes will not work!!!)Description1. Self-learning remote control2. Mainly apply to car alarms, home alarms, panic buttons, garage door, rolling curtain, etc.3. Copy most radio fixed code remote controls4. Learning face to face in few seconds5. Battery included Operating distance 70-100m Coding Mode: Fixed code Frequency: Fixed frequency 433.92MHz Battery Model: 27AVoltage: 12VSize: 31mm×55mm×14mm How to clone your remote control 1) Click and HoldFirstandSecond buttons together - Led will flash 3 times2) Keep holding First button and release Second button ( keep holdingFirst button since step 1 )3) PushSecond button 3 times, Led will start flashing Non-stop. ( Keep holdingFirst button since step 1 )4) Put both remotes Into Back to Back position ( II ) !Make sure they have direct contact , touching, push a bit, to make them touch each other harder5) Click and holdone button on your original remote andone button on your clone remote. Keep holding until led will make : 2 blinks > 3 blinks > Steady = Successfully cloned, only after the light goes into steady.Code Recovery - Use ONLY when you mistakenly removed the code copiedPress and hold the left two buttons (lock and mute label) at the same time for approximately 3 seconds, then LED indicator flashes three times, followed by a continuous fast blinking, indicating that the original remote control codes have been restored. Troubleshooting · After many tests remote control won't cloning, or cloning successful, but not operate the gates.Can be few reasons:1. Your original remote control battery is low power. (even if working fine)Solution - Change new battery. (If you got multimeter check voltage. If voltage less than 1 Volt battery no good even if new. For example Battery must be 12V you got 11V)2. Please make sure factory testing code is deleted, before start cloning.If code clearance done properly, short press any button. Light won't flash at all.If light flash when short press any button clearance process done wrong. Please repeat clearance process again.3. When cloning led blink twice and no more.Please be patient. Don't decide remote is faulty. All remotes deep tested before despatch and 100% working order.You must find the best cloning position. In most cases the best position is back to back. But not always. On different models may be you need use other positions (face to face, side to side, like T position and etc.) Please watch video bellow. As you see on video first button clone ok, second button not (video time 0.22s) led blink twice and no more. Only when i moved remote down just a little cloned successfully.